Tech’s tennis team hosted the third MLK Invitational at the Ken Byers Tennis Complex last weekend after a double victory against East Tennessee State and Presbyterian. The tournament was an important one on Tech’s schedule, not just because they were the hosts but also due to the caliber of their opponents. Tech began the weekend outranked according to the Intercollegiate Tennis Association (ITA) rankings posted earlier this month. The round-robin tournament assigned no scores and declared no winner, but in three days of competition, the Jackets played admirably. Last Friday, the team kicked off the invitational against Mississippi. Unfortunately, not all Jackets were able to begin the weekend Friday afternoon. Sophomore Michael Kay spent Friday and Saturday resting a strained arm. With Kay on a two-day hiatus, Coach Kenny Thorne tested other doubles pairings, to positive results. Unable to play alongside his brother, redshirt senior Casey Kay paired with junior Cole Fiegel in his stead. Fiegel and Kay were one of two Tech doubles teams that won doubles matches on day one. Nathan Rakitt and Hong Kong native Andrew Li also won their doubles match, a positive start to their weekend. 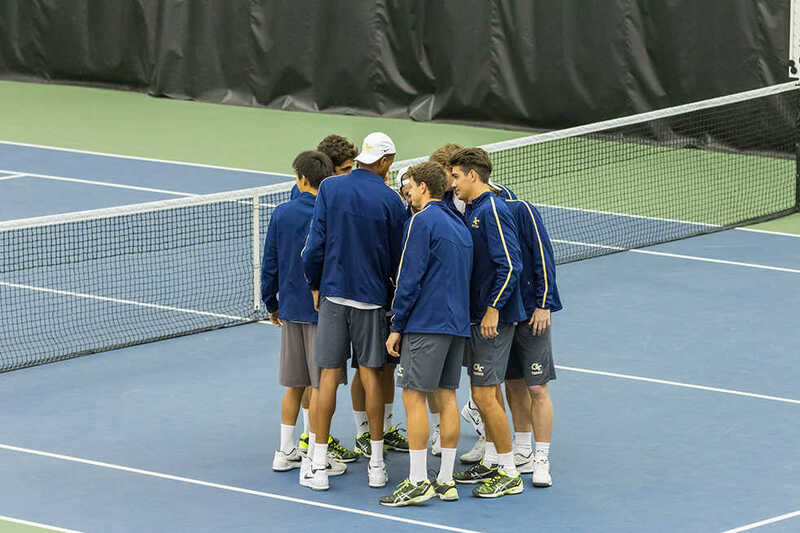 The Jackets won four of eight singles matches on the first day, an impressive figure considering the teams they had faced and the colleges they were yet to encounter. Tech opened the second day of the invitation against second-ranked Oklahoma, a tall task for any team. Sophomore Christopher Eubanks added another singles victory to his weekend tally. Eubanks was paired with Rakitt for doubles, but the pair was unable to turn their opportunity into a win for the Jackets. Carlos Benito and Li defeated Oklahoma’s Florin Bragusi and John Milstead 6-3. Defeating Bragusi, a Romanan native, was no easy accomplishment; the junior played an instrumental role in Oklahoma’s success last year and was one of the top 1000 players in the world at one point, according to Association of Tennis Professionals. The second day came to a close with two out of four singles victories and a single doubles victory. Matched up against rivals Georgia on day three, the Jackets hoped to end the invitational on a high note. Michael Kay returned to the court and earned the biggest win of day three against Paul Oosterbaan, a redshirt sophomore considered one of the top college recruits in the country when he committed to Athens. Wins like the one against Oosterbaan will prepare the team well for the high-powered teams it will continue to face, particularly at the upcoming ITA Indoor National Team Championships. Andrew Li looked to build on Kay’s win by earning one of his own. He started a bit sluggishly, but nonetheless recovered and brought in a second singles victory for Tech. Cole Fiegel and Daniel Yun earned the Jackets their only doubles victory on the final day. While the MLK Invitational was structured in a manner that would not designate a winner, there is little doubt that Tech men’s tennis benefitted greatly from the competition. It faced elite teams, played them at a high level and even earned a few signature wins. For a team headlined in large part by young talents such as Li, the tournament was a truly valuable experience, providing a taste of championship play. The ITA Kickoff weekend at UCLA in Los Angeles, California is up next for the Jackets. Tech will take the court against a New Mexico lineup ranked No. 41 in the ITA. Facing the Lobos is a daunting task, particularly for a Jackets team dependent on young players like Wei and Eubanks to play with maturity beyond their years of competition.